How I uncovered my secret identity as a would-be oil tycoon. This summer, James West and I hopped in our mud-caked rental sedan and followed the oil tankers out of Williston, ND. On my notepad was a scribbled address, a spot deep in the North Dakota prairie, just off the shores of serpentine Lake Sakakawea, twenty miles from the nearest town. As we drove oil rigs cropped up in every direction, each indistinguishable from the last. But somewhere out there was the one we were after: the one with my name on it. 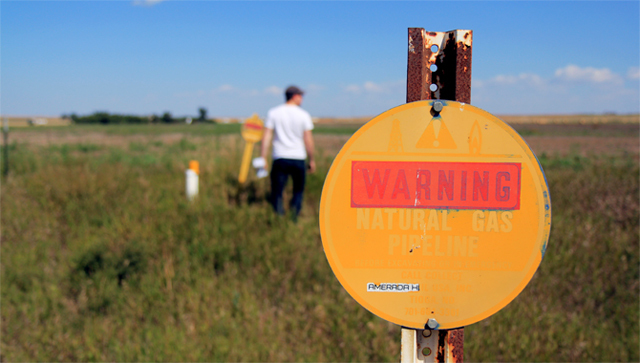 In the most recent issue of Mother Jones, we reported on the explosive growth happening in North Dakota as a result of fracking. The drilling technique has unlocked massive deposits of oil from the Bakken Shale, which translate directly to massive deposits of cash for everyone from truck drivers to rig operators to local strippers to the Big Oil kingpins of Houston and Oklahoma City. And in the interest of full journalistic disclosure, I think it’s about time I came clean: A few of those dirty fracked dollars are in my family’s greasy little pocket. A couple weeks ago, my grandma, a wise and exacting matriarch with a bone-dry wit, cashed in her latest fat paycheck from ConocoPhillips. She claims to have “already forgotten” how she spent the money, a cool $27.82. That’s right: In the last several years, as fracking has grown into one of the most divisive environmental issues of our time, my family has profited from it to the tune of nearly $200. It goes back to a fateful day in 2008, shortly after George, Nana’s husband, “Papa” to me, passed away. Sorting through papers in his gargantuan old rolltop desk, Nana, 82, came across a yellowed, official-looking document with the imprimatur of the State of North Dakota. It dated from the early 1930s, and conferred mineral rights—that is, a claim on anything sucked up from under the ground, but not the surface itself—to a plot of land identified only by an obscure numbered code. A few phone calls to distant relatives and estate lawyers later, Nana found that the rights were originally purchased by her uncle Stewart Kelley, who lived in Omaha at the time but had grown up in the early twentieth century in Lakota, North Dakota, across the state from the plot he eventually staked. A succession of deaths and wills led the document to Papa, and now it was in Nana’s hands. Our take from the oil was… small. Really small. Like, 0.029297 percent. Good thing she didn’t. Within a few months, Nana’s phone rang with a call from Burlington Resources, a subsidiary of ConocoPhillips, looking to lease our rights. Past attempts to drill here had come up empty handed, but she figured: What the hell? So she agreed. By the summer the developer, with modern fracking technology at its disposal, tapped the Bakken Shale in our spot and started carting away oil by the thousands of barrels. But for us that didn’t exactly mean a meteoric rise to the oil-garchy: Divided between other rights holders in the area, and the company itself, our take was… small. Really small. Like, 0.029297 percent, according to Nana’s pay stub. In September 2009, the well cranked out 202 barrels of oil, worth about $12,500, and Nana got her first cut: $3.66. Only a couple quarters shy of a large latte. With this in mind, curious about what we might find and desperate to escape the frenzy of Williston, we hit the road. We drove until the paved highway turned to dirt, through rolling green and yellow grassland, over “criks”—North Dakota-ese for “creek”— and between incongruous outcrops of crumbling rock. We drove past abandoned farms and grey, disintegrating clapboard ranch houses, long since left for dead, relics of a vanishing period of North Dakota history. In their place, here in the heart of the Bakken, were the tools of a new breed of pioneers: Lifted pickup trucks, air-conditioned office trailers, razed dirt lots, and a shiny oil rig hard at work every half mile down the road. Finally, a hard right on County Route 6, and we’d arrived. The Washburn Angus ranch, and the home of the Washburn family, is adrift in the middle of all this. It’s a beautiful house walled in by flowers, with a few head of cattle moseying around, flurries of grasshoppers, and a big, dumb, slobbery dog at the door. Still, not exactly a palace considering the riches underfoot: The Washburns own the land that sits so inconveniently on top of my minerals. I wanted to ask them about the changes in this area, about the wells, if they knew who my great-uncle was. But it was Sunday morning, and the Washburns were nowhere to be found. (They still haven’t returned my phone calls.) So we were left to explore on our own—outside of any fences, of course. There were a few other well holes on our plot, which I knew from my research were dry—the explanation for how our rights could have gone unnoticed in a desk drawer for more than half a century. Natural gas flares dotted the horizon and a deep, industrial gurgling resonated through the whole area, but there wasn’t a soul in sight, and no other clues as to which of these many wells was the one funneling lunch money to my grandma. So we packed up and left the oil fields in our dust.